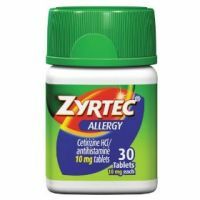 With the Zyrtec Allergy Relief 24 Hour Allergy Medicine you get all-day allergy relief. Whether you're getting ready for an early hike or an early office meeting, allergies can really ruin your day. Allergy symptoms such as sneezing, itchy throat and runny nose can happen outside when there is too much pollen or mold in the air.